Lyman Hall/H-K/Coginchaug celebrates its Division III hockey title. Greg Vasil – Hearst CT Media. It began February 7 with the Class S Indoor Track & Field Championship, and concluded March 19 with the Ice Hockey Division I Championship. That was the 2019 CIAC winter championship season in which dreams were made, hearts were broken and many, many memories were made. Every championship game, every dramatic meet, every competition had a story. These are all those championship stories, thirty-six of them in all. For those unfamiliar (or simply as a reminder for those who are previously familiar) Linked Up Championships will provide a link to the local media story for all of the CIAC Championships over the course of the season. It provides a one-stop shop for anyone looking for great stories on championship-winning teams. From the Meriden Record-Journal: Two local kids and some neighboring friends helped Lyman Hall/H-K/Coginchaug make history with a Division III title. From the Connecticut Post: It was a story with a familiar ending as Fairfield Prep again captured the Division I Championship. From the New Haven Register: Players doing what they had to do helped Branford earn a state championship in Division II. Norwalk celebrates its last-second Class LL win. Christian Abraham – Hearst CT Media. From the Norwalk Hour: In dramatic fashion, Norwalk capped an unbeaten season with the Class LL title. From the Hartford Courant: Cromwell’s Najla Cecunjanin took over late to help Cromwell hold on for a Class M championship. 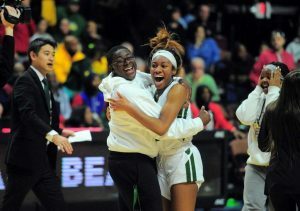 From the Stamford Advocate: Their coach joined elite company as Trinity Catholic won Class S and produced a big turnaround. From the New Haven Register: It had been eight years since Hillhouse captured a girls basketball title before the team triumphed in Class L.
Farmington celebrates the program’s first boys basketball title. Brad Horrigan – Hartford Courant. From The Day of New London: Its ability to adapt and change was the key to another state title for Waterford this time in Division II. From TheRudenReport.com: With maybe its best performance of the season, New Canaan won Division IV for its first title since 1962. From the New Britain Herald: Just six years after its inception, Innovation made history with a title in Division V.
From the Manchester Journal Inquirer: A group of seniors provided a bookend to their careers with a state title in Division I for East Catholic. 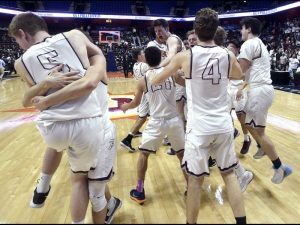 From the Hartford Courant: Behind a poetry-inspired second half, Farmington captured the Class III championship. 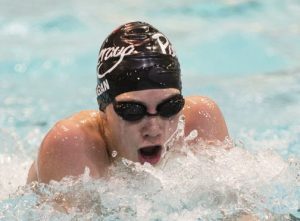 Billy Regan won a pair of events to help Pomperaug to a Class M title. – Waterbury Republican-American. From the Greenwich Time: Greenwich thought it had to be perfect, and in the end perfection was another State Open titles for the Cardinals. From the Waterbury Republican-American: From start to finish, the Class M championship meet belonged to Pomperaug. From the Stamford Advocate: The dip in the pool felt refreshing for New Canaan coach Kat Munson as the Rams earned a Class L crown. From the Waterbury Republican-American: After three-straight runner-up finishes, Holy Cross captured the elusive Class S title. From the Greenwich Time: Greenwich knew it needed a strong showing in LL to get what it wants, and the Cardinals got it with another Class LL title. Jessica Olin provided key performances as Wilton defended its Class M title. Gregory Vasil – Hearst CT Media. From the Norwich Bulletin: On paper, Woodstock Academy looked like the favorite — and the Centaurs delivered for another State Open title. From the Norwalk Hour: Wilton’s coach was nervous, but the performers came through in the clutch as the team defended its Class M title. 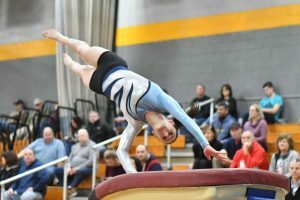 From the Norwich Bulletin: There seems no slowing down the Woodstock Academy gymnastics dynasty after another Class S championship. From the Greenwich Time: Four was the big number of the day as Greenwich captured its fourth-straight Class L championship. From the Danbury News Times: The coach wasn’t sure it would happen, in the end it was another State Open title for Danbury. From the Waterbury Republican-American: Every point and every lineup spot counted for Gilbert which pulled out a narrow win for the Class S title. From the Norwich Bulletin: Killingly proved emphatically this year could also be special as it earned the Class M championship. From the Bristol Press: Bristol Eastern needed a strong finish — and got it — to win a third-straight Class L title by a slim margin. From the Danbury News Times: The performances surprised their coach but the result was familiar as Danbury earned another LL crown. 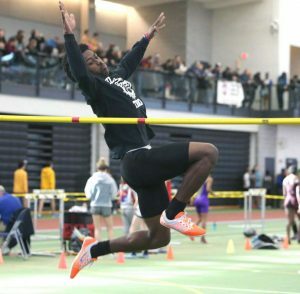 Neal Eley and his Hillhouse teammates came away with a championship in Class M. Emily J. Reynolds – Hearst Media. From the Hartford Courant: A dramatic finish led to the first-ever State Open title for Hall. From the Middletown Press: A small team roster did not prevent Xavier from coming home with the Class L championship. From the Hartford Courant: The Hall runners felt the pressure, and came through to win the Class LL title. From the New Haven Register: There was drama on the girls side, but in the boys M meet Hillhouse rolled to the championship. From the Hartford Courant: Bloomfield could not be more at home at the Floyd Little Athletic Center en route to another Class S title. 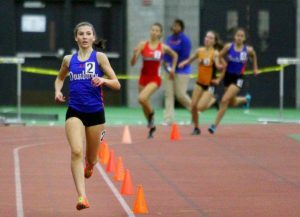 Danbury’s Lauren Moore earned a win to help the Hatters to the Class LL title. Christian Abraham – Hearst Media. From DyeStat.com: Bloomfield’s top athletes performed to their levels, which was good for a State Open win. From the New Haven Register: It came down to the final event as Hillhouse pulled out a dramatic Class M win. From the Hartford Courant: Cori Richardson wasn’t going to let her high school career end without some memorable moments as she helped Windsor win Class L.
From the Danbury News Times: One race proved particularly critical as Danbury outlasted the competition to earn a title in Class LL. From the Hartford Courant: Sprinting success carried Bloomfield to another win in Class S.